Controller within the meaning of the General Data Protection Regulation (“GDPR”) or any other applicable law is the respective Blefa company published in the imprint of the website, click here. The database and its contents remain at BLEFA or stay with data processors and servers acting on our behalf and responsible to us. If you set up a customer account on our website, the personal data you provide (e.g. name, address, e-mail address, telephone, title and access data) will be stored and processed in BLEFA`s customer database. This data is processed in order to fulfil a contract or pre-contractual measures. You can deactivate your customer account at any time and/or object to the further storage and use of your personal data for this purpose without giving reasons with effect for the future by contacting the contact address given below. In the event of an objection, we will delete your personal data immediately. In case of deactivation of the customer account we will also delete your customer account. If you contact us (e.g. via contact form or e-mail), your personal data that you provide us in the contact form will be stored and processed by BLEFA. Which data are collected in the case of a contact form can be seen from the respective contact form. These data are stored and used exclusively for the answering of your request and/or for the establishment of contact and the associated technical administration. The processing of this data takes place for the fulfilment of a contract or pre-contractual measures or the processing is also in our legitimate interest, without conflicting interests outweighing your interests in this respect, since the processing of these requests is in our mutual interest. If you register for our newsletter service, your personal data (e.g. name, address and e-mail address) will be stored and processed by BLEFA for marketing, advertising or promoting purposes. The processing of this data is based on your consent or takes place for the fulfilment of the contract. In this case, we will regularly send you promotional information about the services and products associated with products, services, offers or events of BLEFA. You can opt out of receiving such newsletters at any time without giving reasons for the future by contacting the contact address below or by unsubscribing via the unsubscribe option provided in the newsletter. Once you have unsubscribed, your e-mail address will be deleted from our newsletter distribution list immediately, with exception of a copy in our opt-out database for which we assume a legitimate interest to hold so we can ensure you are no longer served with newsletters. We do not use performance or other optional cookies ourselves. However, sometimes we use software of third party provides for analytics purposes that require the use of their (third party) cookies. We use this technology to measure the visitors’ responses to our sites and the effectiveness of our advertising campaigns (including how many times a page is opened and which information is consulted) as well as to evaluate your use of this website. The third-party partner or the web analytical service partner may be able with your consent to collect data about your visit to our and other sites because of these internet tags/cookies, may compose reports regarding the website’s activity for us and may provide further services which are related to the use of the website and the internet. Below, please find information on those cookies and how you can at any time withdraw consent/opt-out the use of such cookies. For more information, please visit www.google.com/analytics/terms/de.html or https://support.google.com/analytics/answer/6004245?hl=en. We use on our website “Google Tag Manager”, provided by Google Inc, 1600 Amphitheatre Parkway, Mountain View, CA 94043, USA (hereinafter referred to as: “Google”). The Google Tag Manager allows us to manage web page tags from a single interface. The tool Google Tag Manager, which implements the corresponding tags, is a cookie-free domain and does not collect any personal data itself. Google Tag Manager triggers other tags that may collect data. Google Tag Manager does not access this data. If deactivated at the domain or cookie level, it will remain in effect for all tracking tags implemented with Google Tag Manager. We use Google AdWords in order to present our advertisements on third party websites. We use this service to provide you with a personalized website experience. The advertisements are delivered through so called “Ad Servers”. We use Ad Server Cookies to measure fade-ins of advertisements and clicks. If you reach our website through a Google-advertisement Google will place a cookie in your browser. This Cookie will be stored for 30 days and is not intended to identify you. BLEFA does not collect or store personal data by using Google AdWords. We only receive statistical evaluations from Google that inform us which advertisement is most efficient. If you have an account on Google, it is possible that Google can assign your visit on our website to your account. Even if you are not registered on Google, Google is able to track your IP-address and to store your data on its server. We include third-party services and/or content on our website. When you use such third-party services or when third-party content is displayed, communication data are exchanged between you and the respective provider for technical reasons. BLEFA controls neither the websites, nor the privacy practices, of the third parties managing these websites. The privacy practices of third party website providers may differ from BLEFA’s, so we cannot endorse or make any representations about third party websites. Please check these policies before you submit any personal data to these websites. Our website may contain links to and from the websites of our partner networks, dealers, affiliates or other third parties. Upon accessing these links, the BLEFA website is automatically exited. BLEFA controls neither the websites, nor the privacy practices, of the third parties managing these websites. The privacy practices of third party website providers may differ from BLEFA’s, so we cannot endorse or make any representations about third party websites. Please check these policies before you submit any personal data to these websites. BLEFA uses so-called social plugins (‘buttons’) of social networks such as Facebook, Google+, LinkedIn, YouTube and Twitter. When you visit our website these buttons are deactivated by default, i.e. without your intervention they will not send any data to the respective social networks. Before you are able to use these buttons, you must activate them by clicking on them. They then remain active until you deactivate them again or delete your cookies (please refer to ‘Cookies’). After their activation, a direct link to the server of the respective social network is established. The contents of the button are then transmitted from the social network directly to your browser and incorporated in the website by it. After activation of a button, the social network can retrieve data, independently of whether you interact with the button or not. If you are logged on to a social network, the network can assign your visit to the website to your user account. A social network cannot assign a visit to other BLEFA websites unless and until you activate the respective button there as well. We do not pass on any personal data to third parties unless this is necessary for the fulfilment of the contract, permitted by relevant legal provisions or you have given your consent. This being said, BLEFA may contract with other companies or individuals (“Processors”) to perform certain duties on our behalf. In so doing, it may be necessary that we provide the Processors with access to personal data. Our Processors are required to maintain the confidentiality of the personal data, and are restricted from using the information for any other purpose than the purposes defined by BLEFA. Examples of duties performed by Processors include business partners or sub-contractors in technical, payment and delivery services, credit risk reduction or fraud protection, analytics providers, search information providers or intragroup processing. They will only have access to the personal data necessary for the performance of the respective activity. In particular, these Processors are prohibited from processing or using your personal data for other purposes. Further processing of the data by our sister company Blefa Kegs Inc. is possible if this is expedient for the initiation of business or the fulfilment of a contract. eMail “Dinah.Quist@blefa.com” is available on site. BLEFA is a global organization. Therefore, our privacy practices are designed to provide protection for personal data all over the world. It is BLEFA’s policy to give access to personal data only to those authorized employees, agents, contractors, entities and Processors that BLEFA determines have a legitimate need to know, or have access to, the information in order to carry out their responsibilities. BLEFA uses technical and organizational security measures to protect the data supplied by you and managed by us against manipulation, loss, destruction, and access by third parties. Our security measures are continually improved in line with technological developments. You may be entitled to exercise your right to object, on grounds relating to your particular situation, that your personal data shall be subject to a processing. In this case, please provide us with information about your particular situation. After the assessment of the facts presented by you we will either stop processing your personal data or present you our compelling legitimate grounds for an ongoing processing. BLEFA BEVERAGE SYSTEMS is one of the world's leading suppliers of stainless steel kegs for beer, wine and soft drinks and is part of the internationally active Artemis Holding (Aarburg, Switzerland). BLEFA BEVERAGE SYSTEMS employs over 140 people in Germany and around 40 in the USA. All stainless steel beer, wine and soft drink barrels are manufactured at our headquarters in Kreuztal. Our US branches in La Vergne (TN) and Vancouver (WA) provide our customers not only with kegs from stock (KwikKegs), but also with a stationary and a mobile keg service. 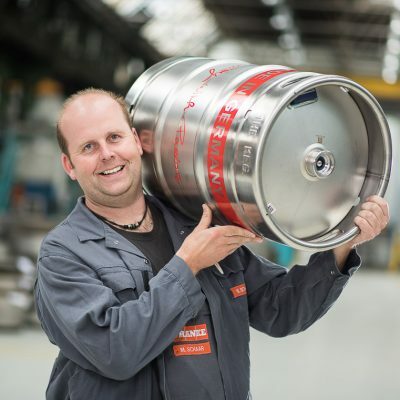 ARE DURABLE UND RELIABLE HIGH-QUALITY STAINLESS STEEL KEGS A COINCIDENCE?